Somewhere in the USA, someone files a frivolous lawsuit and makes a mockery of our justice system. Recently, an ex-Taco Bell executive from Southern California assaulted an Uber driver in Newport Beach, and is now suing the driver for $5 million dollars! Benjamin Golden was drunk when Edward Caban picked him up. There's a viral video that shows Golden attacking Caban throughout the trip. If that isn't enough to make you smack your head in disbelief, how about this story? Lambert's Cafe, who proudly bills itself as the "Home of Throwed Rolls," is being sued by a woman for severe eye, head, and neck injuries resulting from one of these tossed baked goods. 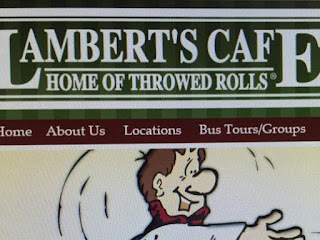 The Sikeston, Mo., based chain is known for serving huge portions of Southern, home-cooked favorites, but the airborn delivery of fresh, large, pillowy-soft rolls, then topped with apple butter, molasses or honey, is what truly makes the restaurant unique. According to a story in USA Today, Troy Tucker claims she suffered "severe and permanent" personal injuries to the neck and eyes as a result of one of these rolls. This is the 2015 version of the now infamous Liebeck v. McDonald's suit where Liebeck was awarded nearly three million dollars for spilling hot coffee on herself (it was later reduced to $500,000). It remains to be seen if Tucker will make a sucker of the legal system...once again.